...And close to home for new adventures and experiences there. ...and traveling even more than we did before! So where did 2008 take us? Very domestic in the first part of the year. We started our 2008 travels very close to home, but it's a vacation spot we can visit for a day trip or a long weekend... which we love to do. We played golf with friends and watched from the greens of the little Pacific Grove golf course as California Gray Whales spouted off shore. A little bird watching, a little wine tasting, and a couple of terrific meals. Just don't tell anyone about the great weather! The Tour de California Bike Race came right by our house, so we threw a "tailgate" party for neighbors and friends and cheered the riders on... it was almost as good as going to France?!?! Well, not really, but it was cool, and shows that you can have adventures close to home and without spending tons of money... Good in this economy, eh? In Spring, our 2008 travels at least got us out of the state. We went to Phoenix for a San Francisco Giants Spring Training game. We combined it with visits to friends in Phoenix and Tucson and did a little bird watching here too. We went to Augusta with Mark's brother and sister-in-law to see practice rounds of the Master's Golf Tournament. Now, our January weekend aside, we're not golfers, so we weren't sure about this, but we LOVED it. We were lucky and got tickets to see Monday and Wednesday's rounds. On Wednesday they have the "Three Par Tournament". All the old players come and play a little 9 hole course for fun... both courses were beautiful and all of it was fun for us. We explored Atlanta before the tournament and the Biltmore Estate after... even got a deal to stay at the Inn which gave us two days to see the "house". Came home out of Charlotte. We really got into our International 2008 travels with a whole new area of the world. Flew into Amman and met up with travel buddy Joe (solo on this one). Joe had a friend from his old TWA days who had an apartment there... and Omar let us use it. Next we explored downtown Amman and spent an afternoon floating on the Dead Sea before having dinner at Atef's house (our driver and new best friend!). His wife cooked us mansaf--a local dish that is a huge plate of rice, meat, nuts and sauce that you eat with your hands. It's usually for special occasions, so his kids loved that, and we loved meeting the family. Atef drove us to Petra where we spent a day and a half exploring, hiking and riding camels... it's a bigger site than we thought and better than the Indiana Jones movies! We went into the desert of Wadi Rum and spent the night with the Bedouins in tents... Climbed sand dunes, hiked through canyons and explored the areas where Lawrence of Arabia hung out. Finally, we drove on down to Aqaba on the Red Sea... managed a dive in the Red Sea and some relaxing after our night in the Bedouin tents. This was the really big trip for our 2008 travels. Travel buddies Joe and Eunice met us in Paris and we all got on the Air France flight. We spent a couple of days in Antananarivo (Tana), the capital, to get readjusted, explore and most important, to make sure we were there on time because we had a tour for the four of us set up. First drove to Ranomafana National Park to see the lemurs and chameleons of that rain forest. After a couple of days, a long drive took us to Isalo National Park for beautiful hikes in limestone canyons and swims in natural swimming holes. Almost all the drives we had were long--the roads were the worst we had ever seen... but... the countryside was interesting and the whole experience was a good one. Next, a long drive, a night in transit, a flight and another drive so we could spend a couple of glorious days in Berenty Private Reserve. The lemurs here are very tame... the Ring-tailed Lemurs scamper around the grounds and the Sifakas dance from tree to tree early in the morning and late in the evening just like you see on wildlife shows. We did night walks and day hikes, explored the tamarind gallery forest and the spiny forest which is unlike anything I've ever seen. This little sportive Lemur was hiding in the Spiny Forest. So many plants and animals of Madagascar are endemic that even when they look familiar, they end up being something new! 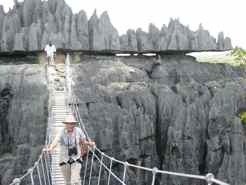 Another flight and a very long drive took us to the Tsingy... a whole area of limestone pinnacles that defy description. I could say they are fantastic, but that word is over used and doesn't do them justice. We did a hike in the "Big Tsingy" that is the closest we will ever come to rock climbing. It was hard, but once we were done, it really was fantastic... overused though the word is, it’s what we thought! Our last several days were spent in Perinet... that's what the French called it. 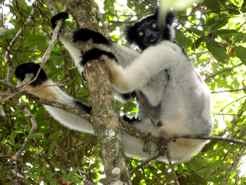 The Malagasy name which is now preferred is Andasibe-Mantadia National Park. There are two sections of great rain forest where we saw new types of lemurs and chameleons. 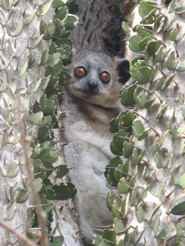 The Indri is the biggest of all the lemurs and one that makes a truly haunting call early in the mornings. What a great way to wake up! That wraps up our 2008 travels. And as to our winemaking efforts... the birds got most of this years grapes. We did bottle our 2006 Zinfandel. Our first taste tells us we have a lot to learn, but that's the fun of it! We already are planning our travels for next year. Can't wait to tell you about them. 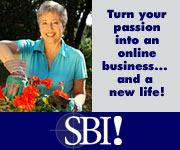 If you want to write a blog or website of your own about YOUR travels or other passions, check out SBI. Time is flying by.... but we're learning it's always time to do what you love!